Since nobody had an answer, i went on, experimenting myself Well in another thread somebody suggested to use zenerdiodes for lowering the voltage. i read on those and even did some maths to find out what Resistorvalue i have to place in front.(min. 90R) I startet with 100 but the Trigger-LED, would again, just glow a little bit, and the sound is just a little click. I changed the resistor values and also exchanged the zdiode, but nothing changed. Actually i even tried to trigger it from 15V directly, the click was a little louder but still not really a kick. I really dont know whats wrong? Is the Method with a Z-Diode maybe not sufficient aswell? Should i use a Voltage Regulator? But i am pretty sure by now that there is at least another error in the Drum-Circuit argh Unfortunately i cant measure the voltages right now, because i destroyed my multimeter recently. Multimeter: I wanted to measure the consumption of the bass drum in Ampere, but unfortunately i was measuring from + to - pole, while the power was on, so my multimeter is broken now. Now i know that you should never do that But apart from the multimeter, is it likely that some parts in the circuit took damage? Depends on the power supply if its broken now or not, when it uses regulator ICs it is probably fine. For the stuff after the power supply, that most likely is still OK, it just saw the power supply go down. The meter may just have blown a fuse? Maybe internal, check it's manual to find out. I made some progress, but its still not working right. First, the Trigger-Signal is working right now, with a stable 12V high. Thats for the good news. Still no proper sound though. I did some measuring, and the problem seems to be right at the beginning of the circuit. after C1, at Pin 3 of the IC, the voltage suddenly drops from the 12V-triggersignal to a lousy 3,4V. on pin2, the other input of the amp, its exactly the same value. whenever there is a trigger, those values go up like 0,01V lol. On the Output (Pin1) however, i measure -13,59V, wich is going up to -13,53. So it seems the voltage is really low suddenly after C1. Maybe this has to be that way, i dont know. but what is really weird, that after the first op-amp stage, the voltage is negative. 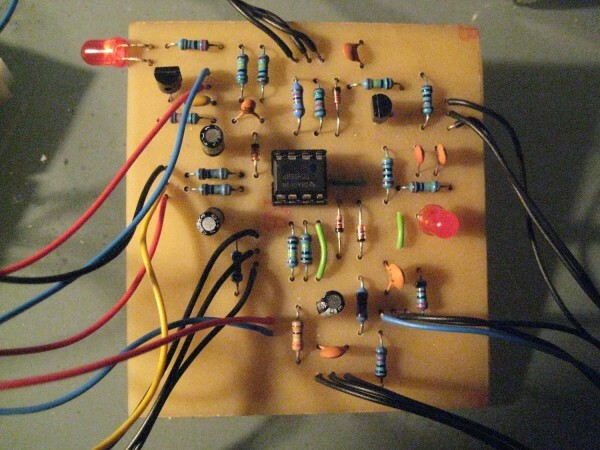 Is this opamp inverting the signal? For the sound. its more a click than a kick. 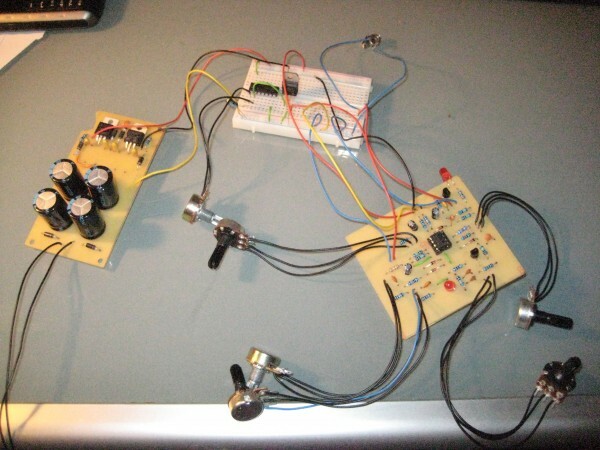 The potentiometers all shape the sound though, in a way. so its not like there is no sound at all. its just much less voluminous than it should be, and super super quiet. have to turn my volume up a lot to really hear it. Maybe someone can point me in the right direction? i dont really know what could be wrong. checked the part values already, there doesnt seem to be an error. Sorry for bumping, but does really nobody have an idea on that? 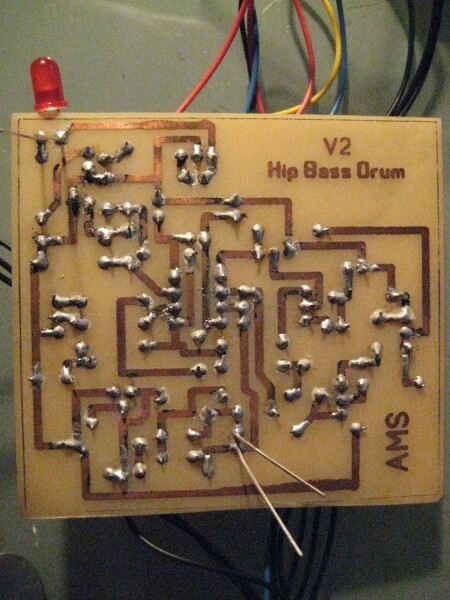 Especially the question if the first op-amp stage is meant to invert the signal? I also noted that neither of the LEDs are blinking (The Trigger LED did before), though they are not broken. Note: I'm on +/-12V supply with a TL072 and +5V gate signal coming from an arduino. I have not done much with the limiter connected yet, but it's a totally different sound with one LED connected there. 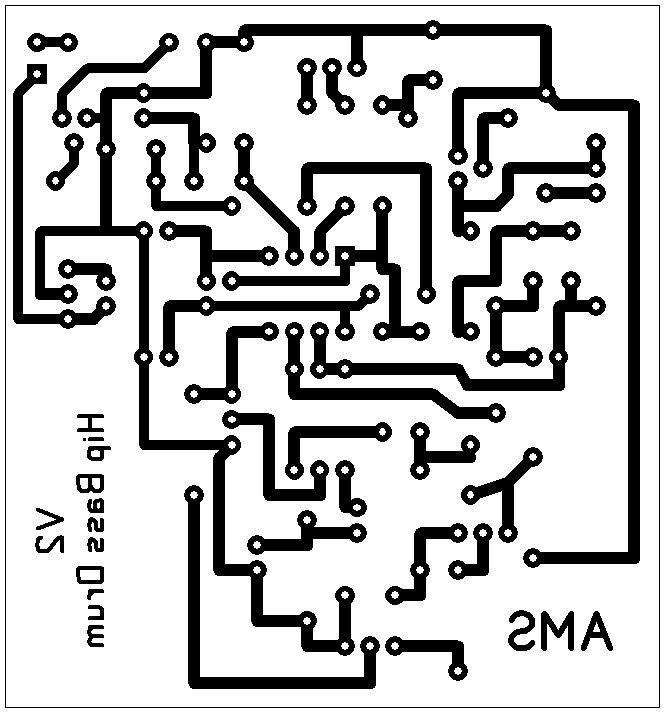 I made a layout with the power lines into a Eurorack connector and generated the g-code to etch this on a router (.2mm 60degree etching bit). I also did a front panel in Cambam but I haven't tried that yet. Hmm, na, i am sure, its not me turning the wrong knobs i attached a file how my kick sounds. i mean it would be okay, if in some positions the kick would sound like this. but i turned all the knobs, and its still jsut like this. Just no PHAT Kick Sound, how it should be. yours Sound as only the click tone is coming out of your unit... is there any Change when you turn the reso, click tone or click tone Level pot? Aww man, i might just try the Strip-Board one. I actually wanted my first self-etched board see to work, but i really need an "Erfolgserlebnis" now. Yes an Oscilloscope is on my Wishlist, but didn't check for one yet. Okay i made some Pictures. In Place of the 6 LED for Limiting there is just one. Shouldn't be a problem, though. You can have a look at it, and maybe you will find something. Hopefully! Thanks! Close Up. The green stuff is dirt from the soldering tin. I don't know, is this normal? I think its the dried flux?! Hey, the Solder is indeed strange. first there are is this weird green dirt everywhere. they emerge out of the liquid around the solder spots. i guess its the "flussmittel". but normally it shouldnt become a green, dry mass later. Also its sparking sometimes while soldering. not really sparks in terms of light, but more sparks in the accoustic sense. it goes "brrz" when i solder. But its not lead-free. In fact it ahs a lot of lead. Its S-Pb60Sn40. I dont know what the S means, but it has 60% Lead and 40% tin. A quick research got me the information that normally it should be the other way round. This might really be the problem. I changed the Trigger-LED because it was not working anymore. After that, the bassdrum actually sounded like a bass drum. I was heavily distorting my soundcard input though, so just a few settings sounded good. so i lowered the resistor value of R16 (just like wackelpeter suggested) However, now the Trigger-LED is broken again, and its super distortet everything haha I need to go to Uni now but, i change the LED again. maybe the resistor in front of it, is broken too? i gonna see tonight. I have used the strip board layout posted here. I use a PC psu with +/-12V. When I connect the -12V to the board the resistor R2(R23 in the original layout) burns after a few seconds. I use 1/4W Metal Film resistors. For the pots I use 20k instead of 10k because they were available. Other than that I use the parts as stated in the layout. I am new to electronics and would appreciate it if someone could give me advice on how to troubleshoot the circuit. You have a short somewhere. Use a meter with the power off to measure resistance (or use the continuity tester function if you have it) between -12V and ground and -12V and +12V. You very likely will see zero (or nearly so) ohms or hear the beep that means there's continuity. 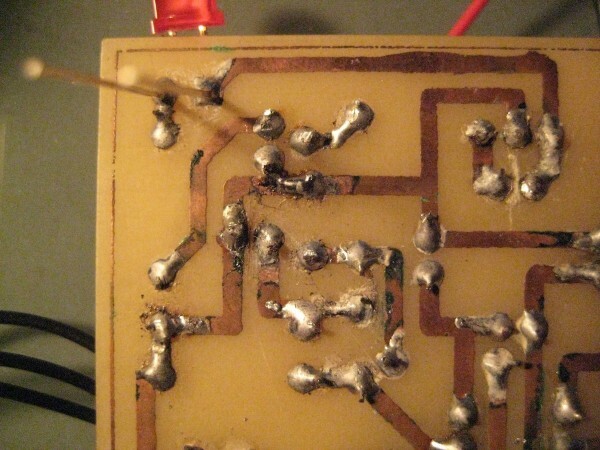 Then trace the tracks for those voltages around the PCB and ensure there are no solder shorts. Then, assuming you've socketed your chips, pull the chips and see if you still have a short. If not, then you have a bad chip; put them back in one at a time and measure after each one to figure out which it is. Also, if you etched the board yourself, examine it with a magnifying glass to make sure there aren't any residual copper traces causing this. Thanks a lot for your informative reply! I went over the board and cleaned it up and found that I had mounted C2 (C10 in the schema) in the wrong direction. After replacing it the resistor does not burn but I do not get any sound. The trigger led D2 (D5 in the schema) glows constantly, with a faint light, even when no trigger voltage is applied. I this the correct operation of the led? Is it possible that other components were damaged? Is the trigger LED supposed to glow constantly or only when a trigger signal is received? Only when a trigger is received. Be careful if you make the stripboard version, 2N3904 are upside down. They need to be inverted, Emitter goes to GND. Pot wiring is inverted too. Cheers it sounds really awesome for a little circuit. Noob question, but whitout it I could not learn. 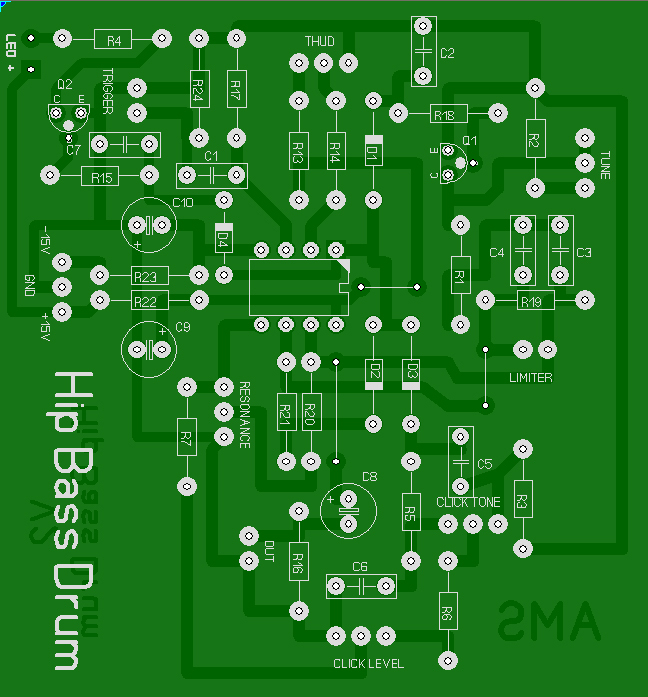 Could the hip bass drum work under +/-9v without any adaptation, and will it sound the same?